It Is What It Is: Trick or Treat! 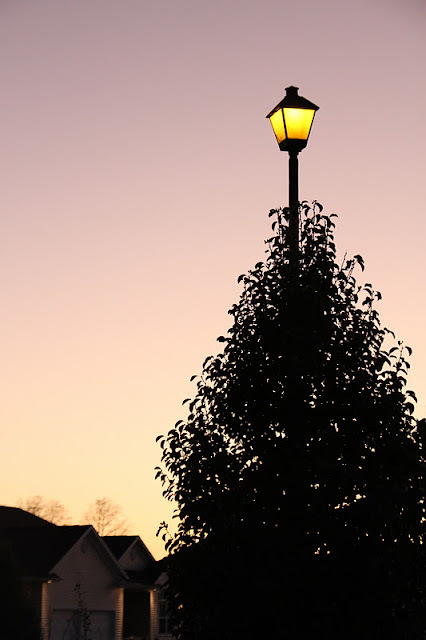 With our pumpkins carved, Halloween was upon us and it was time for trick-or-treating. Joel had to work late all evening and couldn't accompany us. 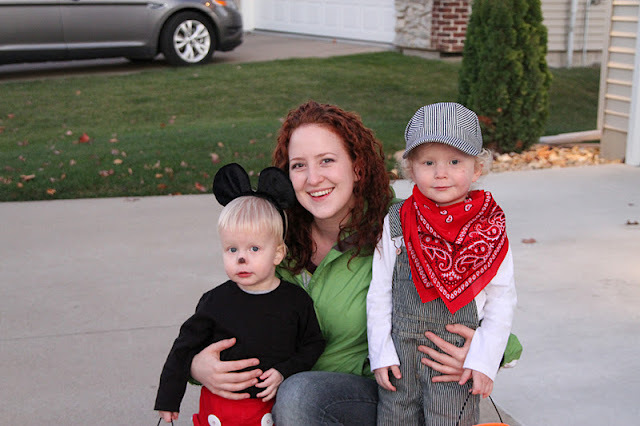 But because of his self-admitted fun-hater stance on Halloween, the boys and I were excited to venture out with Amy, Ethan and Keaton. 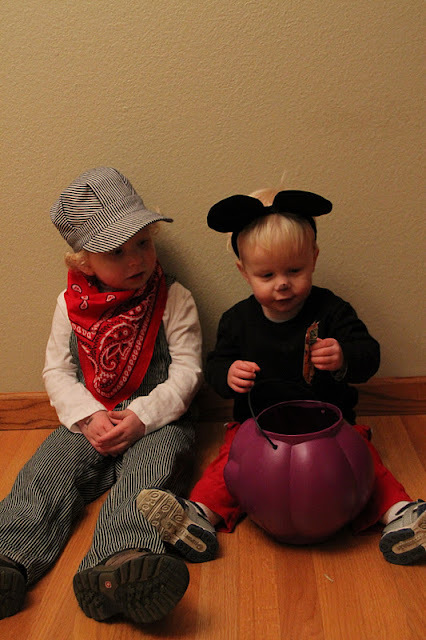 As I dressed our kids, I couldn't help but onder why Joel couldn't get on board with a holiday involving erratic behavior and the gluttonous consumption of candy. 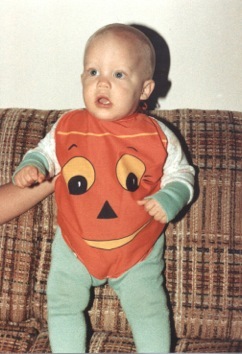 Even as a baby, Joel seemed less then enthused to be dressed as a pumpkin. At five years old, he bared his inner "ninja" for the camera, not knowing that across the country, a little pink bunny was putting on her tail and preparing to beg for candy. Through some cosmic miracle involving a weird story about baseball and some red curly hair, the two of us came together and now years later, it is our kids' turn to walk the streets dressed as their heroes. 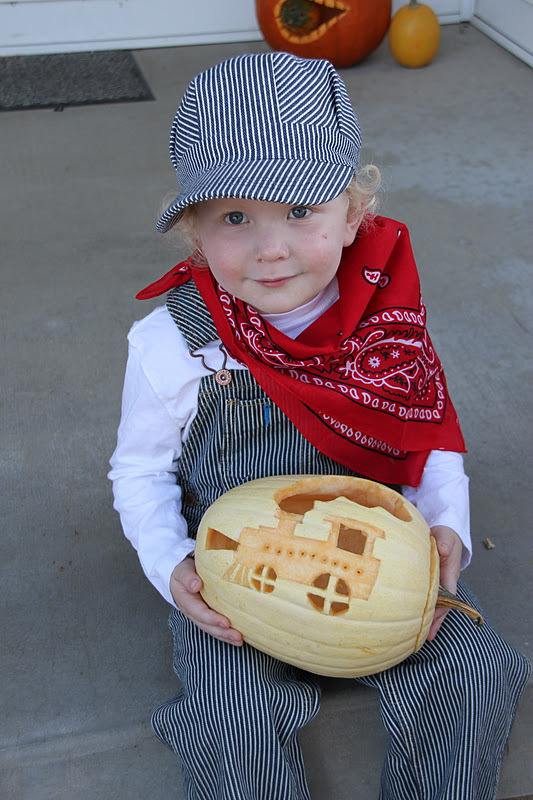 There was no denying Cael's excitement this year because, for a train enthusiast, there is no hero greater than that of a train engineer. I conveniently had many of the necessary components for his costume and only needed to purchase a red bandana that I scored for only one dollar. I helped Cael to suit up and snapped a few photos before helping Graham into his costume. Originally I'd planned to reuse the costume Cael had worn at Graham's age, but pieces were missing from his garden gnome ensemble. Oh, and it was just plain weird. So after digging through bins of old clothes, a pair of red pants prompted me to piece together a Mickey Mouse costume for my littlest Mouseketeer. With his nose painted, the costumes were complete and it was time to hit the streets. We walked a block up the road to Stonebrook, a neighborhood of mostly new homes and families with young children. The streets are usually alive with kids and families, but on Halloween the area practically transforms into a street festival, yet instead of music and food vendors, the streets are littered with jittery screaming children on a sugar binge and smooshed fun-sized butterfingers on the sidewalk. Or if you're me, your Halloween was dampered by two very cold boys that almost immediately spiked fevers when they knocked on the first door. This being Graham’s first chance to walk to the doors and ask for candy on his own, he was cute but disoriented and would frequently walk to a door, get his candy, walk down the sidewalk and do an about-face to return to the same door for more loot. Cael volunteered to hold Graham’s hand and lead him to the next destination. This, my friends, is called “the crazy leading the crazy”. After 7 or 8 houses, their fever and the cold got the best of them and we returned to the house where Cael and Graham collapsed inside the door and checked out each other’s goodies. This is the point at which Halloween goes from a silly thing to do in October to a ration of government proportions—eliciting daily freakouts from boys that want to eat 14 Milky Ways each morning and 27 Hershey bars before naptime. We toasted some pumpkin seeds and handed out candy to the kids that came to our door, many commenting on our pumpkins and my amazingly adorable kids- kids that give Halloween a good name. So even though Halloween may not be Daddy’s favorite, seeing my kids’ smiling faces as they enjoy this silliest of days makes me feel like that pink bunny again. My kids trick-or-treated sick, too. What is up with that? Violet lapped the boys, though -- girl power! !